This paper examines in detail the electrical coupling between the high-, middle-, and low-latitude ionospheres during January 17–19, 1984, using interplanetary and high-latitude magnetic field data together with F region plasma drift measurements from the EISCAT, Sondre Stromfjord, Millstone Hill, Saint-Santin, Arecibo, and Jicamarca incoherent scatter radars. We study the penetration of both the zonal and meridional electric field components of high-latitude origin into the low-latitude and the equatorial ionospheres. In the dusk sector, a large perturbation of the zonal equatorial electric field was observed in the absence of similar changes at low and middle latitudes in the same longitudinal sector. The observations in the postmidnight sector are used to compare the longitudinal variation of the zonal perturbation electric field with predictions made from global convection models. Our results show that the meridional electric field perturbations are considerably more attenuated with decreasing latitude than the zonal fluctuations. As a result, we conclude that variations in the meridional electric field at low latitudes are largely due to dynamo effects. These observations are used to show that the global convection models reproduce a number of characteristics of low-latitude and equatorial electric fields associated with changes in the polar cap potential drop. In addition, we highlight several areas where there is still substantial disagreement between the electric field data and the theoretical results. Fejer, B. G., M. C. Kelley, C. Senior, O. de la Beaujardiere, J. 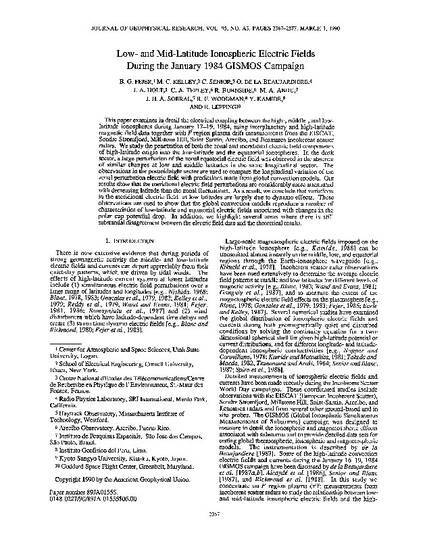 A. Holt, C. A. Tepley, R. Burnside, M. A. Abdu, J. H. A. Sobral, R. F. Woodman, Y. Kamide, and R. Lepping, Low and mid-latitude ionospheric electric fields during the January 1984 GISMOS campaign, J. Geophys. Res., 95, 2367, 1990.